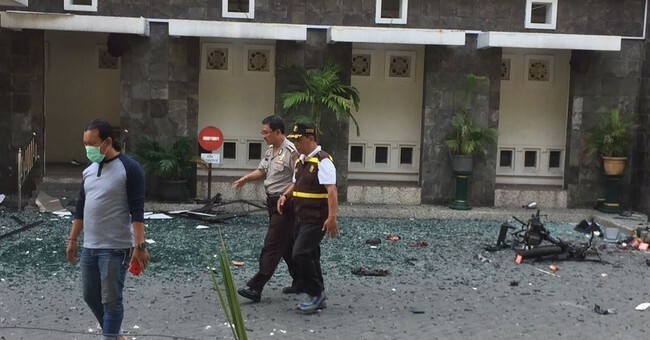 The Wall Street Journal reports that a family of suicide bombers killed at least seven and injured dozens more in attacks targeting Christian churches in Surabaya, Indonesia on Sunday. The Islamic State claimed responsibility for the attacks. Perhaps most shocking about this latest incident of terror is that the families were willing to use children as young as nine years old to carry out the attacks and detonate suicide bombs. According to Indonesia's National Police Chief Tito Karnavian, a family of six recently traveled to Syria where they received training and indoctrination into the caliphate. In one attack carried out by this family, a mother and her two daughters aged 9 and 12 detonated bombs wrapped around their waist near entrance of the church. Across town, their two brothers harmed others by driving a motor cycle laced with explosives onto the grounds of a church before detonating. But this family's father committed the largest attack when he detonated a car bomb. In total, this one terroristic family attacked three churches on Christianity's day of worship. Indonesian President Joko Widodo pledged to uproot the terror cells within Surabaya entirely. As noted by the Wall STreet Journal, ISIS has used children in the past to carry our their terrorism and are "believed to use child soldiers in its heartlands of Iraq and Syria, and The Wall Street Journal reported in 2014 that ISIS religious schools in Aleppo and Deir Ezzour had recruited children. Last year, the terror group published a video of a toddler shooting dead a prisoner in Syria." Indonesia has recently become a hot bed for ISIS activity. The capital city, Jakarta, has had five police officers killed in a prison uprising that was inspired and led by Islamic terrorist forces. ISIS took responsibility and was likely planning out more attacks before Jakarta police killed five other terrorists just this morning. That operation was unrelated to the events at the churches today. ISIS is calling today's attack "three martyrdom operations."